Villa Vittoria - Dunes of Destin! Gulf Front! Private Pool! Free Beach Service! Located in the heart and soul of Destin is its vibrant harbor. Adorned by a recently completed boardwalk, this scenic destination is home to a community of local charter fishing boats, water activity providers, beach shops, restaurants and nightlife spots. Off the harbor, Downtown Destin hosts family fun at both Big Kahunas’ Water Park and the Destin Track. Accommodations in Downtown Destin are comprised primarily of condos and townhomes, conveniently locating guests just moments from the most sought after attractions in the area. Spectacular 5 bedroom, 4.5 bath beach front home located in the exclusive gated community of 'Dunes of Destin' (Downtown Destin) With numerous restaurants and theme parks (big kahuna water park and the go-kart track) there is plenty to see and do in your immediate area! Second Level - main level - Family room w/ gulf views, dining room w/ gulf views, full kitchen, and king bedroom with full bath which is also accessible from hallway. Third Level - King master suite, facing Gulf with private living room area and full upscale bath, queen bedroom, queen bedroom, and full bath. Fourth Level - Tower room with wet bar and large deck facing Gulf, queen size sleeper sofa, and half bath. *PLEASE NOTE - the use of Stairs is necessary to access the pool or beach from the main areas of this home. The only room in this home that has access to the pool deck without the usage of stairs is the ground floor bunk room. Tents, canopies and personal umbrellas are not allowed on the beach. Umbrellas can be rented through the onsite beach service. *This property may have date restrictions that apply. All reservations submitted online are a request until receiving an email confirmation from Ocean Reef Resorts. For more details, please review our Minimum Night Stay under Rental Policies. For over thirty-five years Ocean Reef has distinguished itself as the leading vacation rental property management company on the Emerald Coast. Our current catalogue of exceptional properties spans the Gulf Coast – from Destin to Panama City Beach. Steeped in a tradition of hospitality and exemplary service, we pride ourselves on providing an unmatched vacation experience. The heart and soul of Destin is its vibrant harbor. Adorned by a recently completed boardwalk, this scenic destination is home to a community of local charter fishing boats, water activity providers, beach shops, restaurants and nightlife spots. Off the harbor, Downtown Destin hosts family fun at both Big Kahunas’ Water Park and the Destin Track. Accommodations in Downtown Destin are comprised primarily of condos and townhomes, conveniently locating guests just moments from the most sought after attractions in the area. Excellent location. Home needs repairs. Camille, We are very sorry that you ran into these problems during your stay, we appreciate the feedback and will be sure to have these items handled. Give us a call when you are ready to plan another trip to the beach! In need of a major upgrade. Location was outstanding. Upon arrival the master bedroom level air conditioning did not work. Advertised elevator did not work had to use spiral stair case all week. On day 5 my spouse fell and twisted her ankle trying to negotiate the spiral staircase at night. No outside lighting available at the staircase. That accident ended her fun for the week. The kitchen refrigerator door would not stay closed. I would not recommend this property at all. Other properties in the area are much better and a lot safer. Michael, We are very sorry that you ran into problems during your stay. I see that portable ac units were brought out to keep you comfortable and that we offered to move you to a different property so that you may enjoy your vacation and that was declined. The elevator is non operational and is not advertised anywhere on any of our sites for that reason. The air conditioner has since been repaired. Please give us a call when you would like to return to the area and we can hand select a property that better fits your needs. Fantastic location but construction noise ruined the amazing sounds of the ocean and tranquility of the pool. Home has good bones but needed a thorough cleaning (we found an earring in the master and a ton of hair in the lowest level) might be why we found cockroaches inhabiting that area? Total CR's to date: 5. I suppose bugs are expected in FL but the room with the bunks was where the girls slept so we had some screaming last night. Pool heat requested for additional charge...pool people finally came by yesterday. Happy to say pool is now warm for last day. House can sleep 18 but seating area on main floor will only accomodate 7. Good thing the weather was beautiful and the kids were outside most of the time. Bring your own beach towels as the only linens on premises are for bathing. No non-stick cookware so don't plan on homemade pancakes. Weber grill sitting by trash cans never used by us. Master bed, albeit crazy uncomfortable had fantastic view of the ocean and early morning "dolphin sightings. Again, beautiful home but I would do things much differently if I were charging people what we paid. Robin, thanks for the feedback. We will get with the owner on the bed and housekeeping to make sure that everything is in tip-top shape. We would love to have you back. Give us a shout when you are ready to return. As in many vacation rental places it could have been cleaner and the quality of the linens and towels could have been much better! The mattress covers on the pull out sofas were not clean nor were the blankets. The refrigerator is a little small for accommodating food for 10 or more people for a week. That being said, we had a blast! The location is perfect. The view stunning! The beach lovely!!! Grace, We are very pleased to hear you enjoyed your stay! Thank you for your feedback, and choosing Ocean Reef, please give us a call when you are ready to start planning your next stay at the beach! 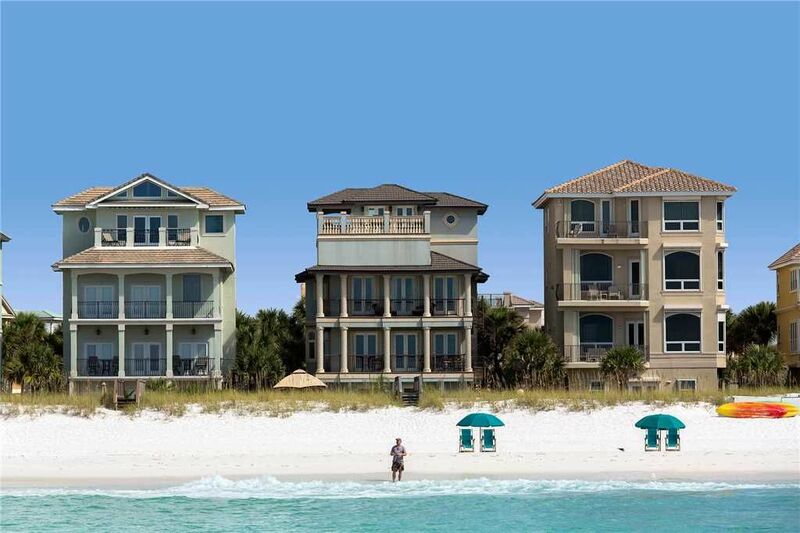 Villa Vittoria is a beautiful home on Destin's beautiful beach. It was the perfect place for my family of 16. We all really enjoyed the private pool overlooking the beach. Being right on the beach was a big plus, and we had a wonderful time. The house lacks a lot of tlc. The pictures on the website are deceiving. Most of the furniture is outdated and very uncomfortable. The beds, as mentioned in previous reviews, are very noisy. After checking it out, I believed it together box springs. The sleeper sofa in the room on the top was broken, thus taking away one of our family member's beds. Three toilets were leaking as well as the shower on the patio. The gas grill, as mentioned in previous reviews, still has not been replaced; although we were able to use it. Ocean Reef was very anxious to help us and responded quickly. They checked about repairs and replacing the sleeper sofa, but the owners declined. Ocean Reef did bring us two rollaway beds. The shower on the patio was completely shut off leaving us without a way to wash the sand off when coming in from the beach. I understand the owners getting frustrated with replacing things because so many people just don't care and don't realize or care that they are staying in someone's home. But for the amount charged for this rental, I feel the accommodations should have been better. We were also told that the elevator in the home had been deactivated for liability reasons. A person with a handicap could not stay in this house because of all the stairs. Thanks for your feedback! We are glad to hear that you enjoyed the home overall and will be sure to look into these matters closely. Thank you for bringing them to our attention. We hope your travels bring you back to Destin soon! I will list some Pros/cons of the House. I will say that on the cons we never contacted Ocean Reef about them as we just preferred to enjoy our vacation and deal with what we had rather than have any back and forth. The area around the house is very nice and plenty to walk to as well as drive to quickly. The house is incredible. Gorgeous views from so many spots on balconies. The location is great as you’re of course beachfront & the water & sand are absolutely incredible. You have everything you would need in the house. The outdoor patio is great compared to other houses nearby. The canopy seating is nice when you need a break from the hot sun & some of us fell asleep on the comfortable couch in there. Beds were comfortable but sort of loud and creaky which was bad when you have a toddler sleeping in your room. The showers in the house are fantastic and I recommend you try them all out. I would definitely suggest staying here in this gated community also as your beach is private. You could look to the left or right and see the beaches were more crowded away from this more private area. You also have 2 free beach chairs waiting for you each day that we were unaware of until we first walked out and were told about. Again, we never contacted them to say anything but per a previous review just before we went they lied on it about the grille. The gas grille was embarrassing. When your paying so much for a place you should get a quality grille. Someone before us complained and it said they replaced the grille which isn’t true. Unless they're referring to the charcoal grille. We utilized what we had and cooked with charcoal. The Gas grille had a new full tank but its so rusted and crusty and there also wasn’t even a connector to connect the tank to the grille. I’m guess this wasn’t fixed due to it being offseason now. The Steps…Yikes. If your staying here in the future you better work on your cardio right Now. I would recommend using the outdoor ones every time if your staying in the basement because using those steep narrow steps from the living room is very dangerous. Overall the house is great. Nothing is perfect but there are a few things that could be made better after so many great vacations. The sink in the kitchen is majorly struggling to work. The DVD player is hidden in a side closet with the house sound system if you want to use it. We finally found it. I had more to post but unfortunately there isn't enough room on here. Thank you for your feedback! Glad to hear how much you enjoyed your stay at Villa Vittoria. I'll follow up on the grill situation - a work order was certainly placed to deliver a new grill last month but it seems to have been missed. That will be corrected today. This home certainly has a good number of stairs, sorry for the work out! We hope your travels bring you back our way soon!